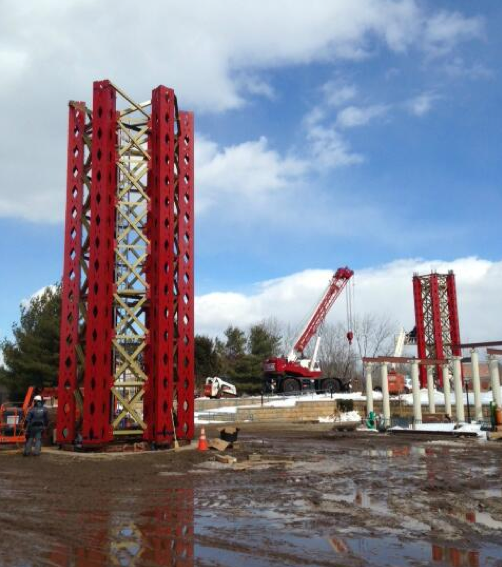 The massive base structure of the New England SkyScreamer at Six Flags New England is now in place, seen above in a recent photo from the theme park. You can see the next segment patiently awaiting placement in the background - and for comparison purposes that first part is only about three stories! That means there are more than thirty seven more stories to go - when complete it will take the record for tallest swing ride in the world. SFNEOnline actually dropped by the park yesterday and got a tour of all the changes being made for the 2014 season. Obviously, the New England SkyScreamer is a big part of those changes! The update they have posted features some great shots from inside the snowy gates of the park, including the very pretty setting for the new ride (looks totally different from the shot above). Check out their update at this link.